I will be jetting off on my first holiday of the year at the end of May which means I've got just over a month to get myself feeling more confident in my own skin. I've been following slimming world for the last two weeks and have been really enjoying cooking syn free dinners. 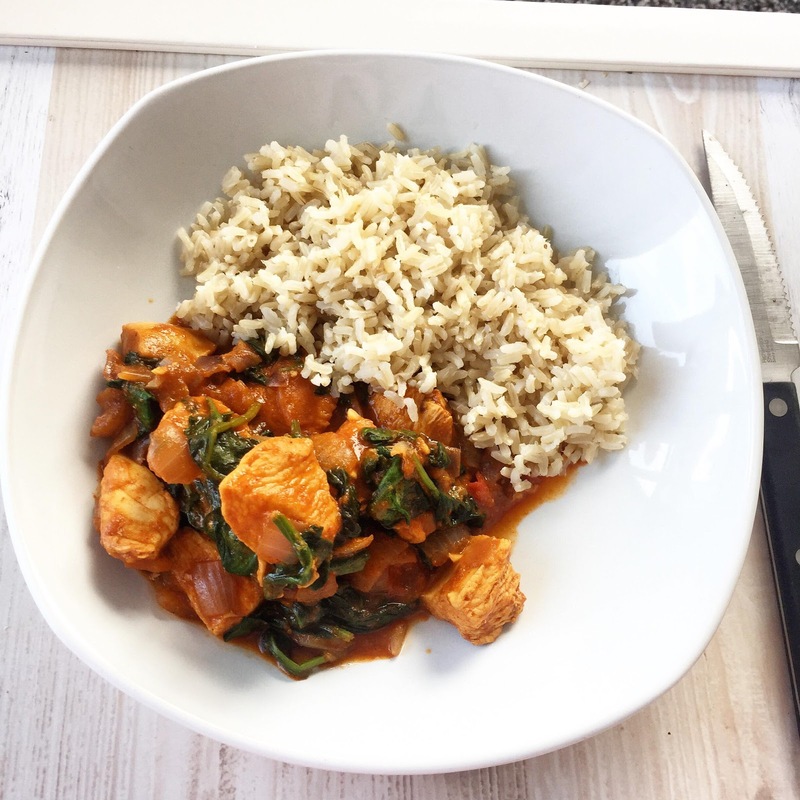 One of our favourites has been the Chicken Saag which we adapted slightly with what we had in our cupboards and I thought I'd share the recipe with you all below! Spray a large frying pan with low calorie cooking spray and place over a medium heat. Add onions and fry for 5 minutes. Then add the ginger and garlic and cook for a further 5 minutes. Next stir in the chilli powder, tomato puree, stock cube and 300ml of water and cook for 2 minutes before adding the chicken and simmering for 10 minutes. Add the tomato, spinach and coriander and cook for a further 5 minutes or until the chicken is cooked through. Take the pan off the heat, stir the yogurt into the curry and season to taste. Serve hot with rice or vegetables. This honestly tasted so much nicer than we originally thought it would. I would definitely cook it again. We served ours with some rice but would probably cook some steamed veg next time to make it a little less filling. What are your favourite slimming world recipes? Let me know which ones you recommend in the comments below!